Posted on October 14, 2010 October 16, 2016 , in HIAB Crane. 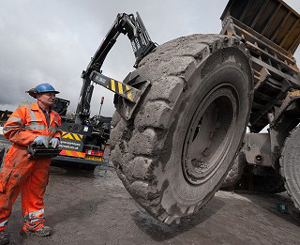 Ace Tyres Services is a UK-based firm that services heavy equipment, like earthmovers that carry up to 100 tonnes of coal. Changing tires on those machines requires precision and the utmost in safety—two traits that HIAB cranes are known for. Since the company’s founding in 1986, they have used HIAB cranes exclusively for one simple reason—their performance has never disappointed. The cranes give Ace Tyres the speed and precision they need, while also providing safety features that help operators do their jobs safely. The company purchased a HIAB XS 211 EP-2 Hi Duo crane last year that enables them to install those 2.5-tonne tires I mentioned off the top. 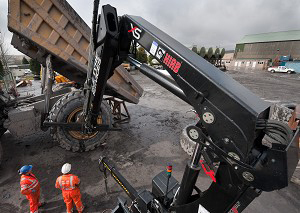 The XSDrive radio remote control on this crane lets drivers move the tires with tremendous control, so they can place them exactly where they are needed and install them safely. 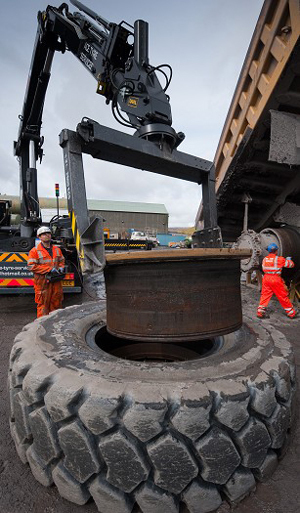 Ace Tyres has several HIAB cranes, each made to the specifications the company requires to service vehicles from a wide range of industries including coal and steel mines. To learn more about Ace Tyre’s most recent purchase, visit our HIAB XS 211 Truck Crane page. For information on other cranes—light, medium and heavy range—visit HIAB Truck Mounted Cranes.